It looks like the town of Solitude, Oregon, may finally put the evil lurking in the dark to rest. 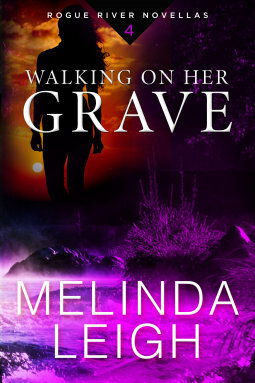 “Walking On Her Grave” is the fourth installment, in the thrilling and suspenseful Rogue River Series, co-written by Kendra Elliot and Melinda Leigh. With sleepy Solitude as Ground Zero for a new drug that is taking lives of prominent citizens of the town, Carly and Seth are caught in the crossfires of danger along with Stevie and Zane as they race against time to put an end to the manufacturers and the distributors. A key teenage witness disappears, and Carly is thrown into danger as she tries to find the boy before he ends up dead. Seth wants to keep his wife away from harm’s way, but with everyone in the town been a suspect, its hard to trust or depend on anyone. When Seth and Carly get too close to identifying the killer, Seth gets too close to death and Carly realizes she’s never stopped loving Seth and she can’t live without him in her life. Now they have to race against time to bring the killer to justice before Seth and Carly can get a second chance at making their marriage work, and keep their family together. Walking On Her Grave gives a fitting end to the Rogue River Series. It is a brilliant compilation of four stories, as emotions and relationships are explored, trust and love is put to test, and loyalty and duty goes beyond normal. Received an ARC from Montlake Romance via Netgalley for a honest review.